Inventory We are a resale marketplace, not a box office or venue. Ticket prices may exceed face value. This site is not owned by Target Center . 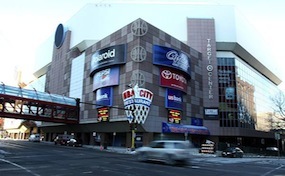 The Target Center is an arena, in downtown Minneapolis, Minnesota. It is sponsored by Target Corporation. The arena has a capacity of 20,500 people, it contains 702 club seats and 68 suites. The center is home to the NBA's Minnesota Timberwolves and the WNBA's Minnesota Lynx, and has hosted RHI and Arena Football League teams in the past. The Target Center held the memorable UFC championship UFC 87: Seek and Destroy in August 2008, which featured the Welterweight title match where Georges St-Pierre defeated Jon Fitch. The Target Center recently hosted one of its most successful events of the year with the Winter Wonder Slam Tour which featured Skillet, tobyMac, and Shonlock. Despite the economic downfall in the Rock industry, especially for concerts, Skillet sold out The Target Center; in the midst of a snowstorm. The Target Center is the first arena to have a green roof. It was unveiled on September 15, 2009. CenterMinneapolis.com is not affiliated with any primary box office or supplier. We are a privately owned and operated business specializing in sales in the secondary market. Ticket prices on our sites may be above or below face value and can change quickly with demand. To buy tickets for any Target Center events in Minneapolis simply click on the event of interest or call our operators at anytime.